In the Winning Wolf slot, again can we observe the execution of a famous unwritten rule in slots game creation/design at work: Add “wolf” to any other word (or, to be pedantic about it, vice versa) and bingo, you’ve got a slots game title and concept! So it is with Winning Wolf, which purports to celebrate the wild canine but is actually more of a paean to the flora and fauna of America’s Pacific Northwest. So there you go. What’s in the symbol set of the Winning Wolf slot? How much can I bet on the Winning Wolf slot? Winning Wolf is a 50-payline slot game; possible wagers run from 2¢ per payline per spin to (theoretically) $5,000 per spin. Incidentally, if someone out there reading this is willing to pony up $5,000 per spin on a slot game, this writer would become your indentured servant for three onths for two spins’ worth of your money. Call me. Does the Winning Wolf slots game have free spins? You bet your doggie bone! The mountain landscape is the scatter symbol. Not only does this scatter symbols pay out 2x, 10x or 100x when three, four or five, respectively, land on an active payline, but it also enters players in the free spins bonus feature. 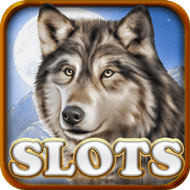 The Winning Wolf slot’s free spins bonus round is heavier on the excitement with some quite lucrative added features. The player is awarded eight free spins – regardless of number of scatters hit – with a different set of reels in play. Additionally, all wilds become sticky wilds. Finally, a bonus five free spins may be added with the appearance of three or more scatters again. Nice. Can I play the Winning Wolf slots game for free? Yes, you may play Winning Wolf and the other fantastic slots listed on our pages right here for as long as you want. Click on the game title (or anywhere near it, really) to launch the game window. Wait a few seconds and you’re off and playing! To play for real money, choose the appropriate option when the game window opens for a redirect to an internationally audited and certified casino website. Play safely and securely with us!